1995-01-05. New. Ships with Tracking Number! INTERNATIONAL WORLDWIDE Shipping available. Buy with confidence, excellent customer service! Benjamin-Cummings Pub Co, 1995-01-01. 3rd Bk&Pst. Hardcover. Used:Good. Benjamin-Cummings Pub Co, 1995-01-01. 3rd/Bk&Dsk. Hardcover. Used:Good. Pearson, 2012. This is an ex-library book and may have the usual library/used-book markings inside.This book has hardback covers. In good all round condition. No dust jacket. Benjamin Cummings, 2006-01-20. 7. Paperback. Used:Good. Pearson, 2012. This is an ex-library book and may have the usual library/used-book markings inside.This book has hardback covers. In fair condition, suitable as a study copy. 1997-09-09. Good. Ships with Tracking Number! INTERNATIONAL WORLDWIDE Shipping available. May not contain Access Codes or Supplements. May be ex-library. Shipping & Handling by region. Buy with confidence, excellent customer service! Benjamin-Cummings Pub Co. Hardcover. 0805342818 . Very Good. Pearson Benjamin Cummings, 2004. 5th or later Edition 1st Printing. Soft cover. Near Fine to fine. photo and line drawings. Nice clean, unmarked (as far as I can tell) 7th edition. Spiral binding, 1st print. Includes PhysioEx 5.0 CD Rom, unused, inside back cover. Gorgeous book, with photos and hundreds (thousands?) of drawings, in color, of just about every part of the body you can think of (Actually, there are drawings OF every part of the body you can think of. 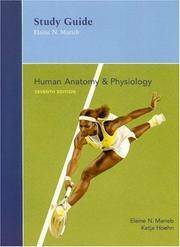 Even if you aren't a nurse, doctor, or med student, this is a super reference manual for the physiology of the human body. Guessed at page count, as it goes up to nearly 700 then there are additional sections that are numbered separately. Pearson, 2010. This is an ex-library book and may have the usual library/used-book markings inside.This book has hardback covers. In poor condition, suitable as a reading copy. No dust jacket. Brand New International Soft Cover Edition written in English but without any Access Code or Card. Different ISBN and Cover Image with US Edition. High Quality Printed on Glossy Paper. Contents and Chapters most similar with US Edition. Occasionally, international textbooks will different exercises at the end of chapters. We do not ship to POBOX, APO,FPO address, 3-5 working days delivery with Tracking number by Fedex or DHL. Some book may show some sales disclaimer word such as "Not for Sale or Restrict in USA or Canada"
Acceptable. International edition. Softcover. Ships SAME or NEXT business day. We Ship to APO/FPO addr. Choose EXPEDITED shipping, receive in 3-6 business days (most US addresses) See our member profile for customer support contact info. 1995-07-06. Good. Ships with Tracking Number! INTERNATIONAL WORLDWIDE Shipping available. May not contain Access Codes or Supplements. May be ex-library. Shipping & Handling by region. Buy with confidence, excellent customer service! Pearson Education. 5th or later edition. Softcover. New. Cutting-edge research areas such as DNA fingerprinting and stem cell research have been added to make Human Anatomy & Physiology , Sixth Edition the most up-to-date text for undergraduates. The enhanced art program helps even the least-prepared students understand key concepts, and the restructured and expanded media package offers students convenient access to more animations, tutorials, and online resources than ever before. Printed Pages: 1274. Pearson Education, 2013. Hardcover. Good. Disclaimer:A copy that has been read, but remains in clean condition. All pages are intact, and the cover is intact. The spine may show signs of wear. Pages can include limited notes and highlighting, and the copy can include previous owner inscriptions. At ThriftBooks, our motto is: Read More, Spend Less.Dust jacket quality is not guaranteed. San Francisco: Pearson, 2003. Oversized 1242pp including glossary index Unopened Sudent Access Kit to MyA& P and unopened CD-ROM Because of the size of this book, it is not available for priority shipping or international orders. Sixth Edition. Glossy Hardback. As New. Pearson, 2010. This is an ex-library book and may have the usual library/used-book markings inside.This book has hardback covers. In fair condition, suitable as a study copy. No dust jacket. Pearson, 2005. This is an ex-library book and may have the usual library/used-book markings inside.This book has hardback covers. In fair condition, suitable as a study copy. No dust jacket. Benjamin-Cummings Pub Co. Hardcover. 0805343601 New Condition. . New. Benjamin Cummings. PAPERBACK. 0805373055 New Condition. . New. Addison-Wesley. Hardcover. 0805301054 New Condition. . New. Benjamin-Cummings Pub Co. Hardcover. 0805342818 New Condition. . New. Benjamin-Cummings Pub Co. Hardcover. 0805343229 New Condition. . New. Benjamin-Cummings Pub Co, 1997-10. Hardcover. Good. 1995-01-05. Good. Ships with Tracking Number! INTERNATIONAL WORLDWIDE Shipping available. May not contain Access Codes or Supplements. May be ex-library. Shipping & Handling by region. Buy with confidence, excellent customer service! Benjamin Cummings. PAPERBACK. 0805373055 LIKE NEW - NEVER ISSUED-MAY HAVE SCHOOL STAMP, NUMBER, MINIMAL SHELF WEAR - EXPERIENCE AMAZING CUSTOMER SERVICE - WE SHIP DAILY . Fine. Benjamin-Cummings Publishing Company, 1989. N/A. Hardcover. Like New/Like New. Benjamin-Cummings Pub Co. Hardcover. 0805343229 Like New Condition. . Fine. Addison-Wesley. Hardcover. 0805301054 Like New Condition. . Fine. Benjamin Cummings. PAPERBACK. 0805373055 Like New Condition. . Fine.